One of the great paradoxes of human endeavour is why so much time and effort is spent on creating things and indulging in behaviour with no obvious survival value – behaviour otherwise known as art. Attempting to shed light on this issue is problematic because first we must define precisely what art is. 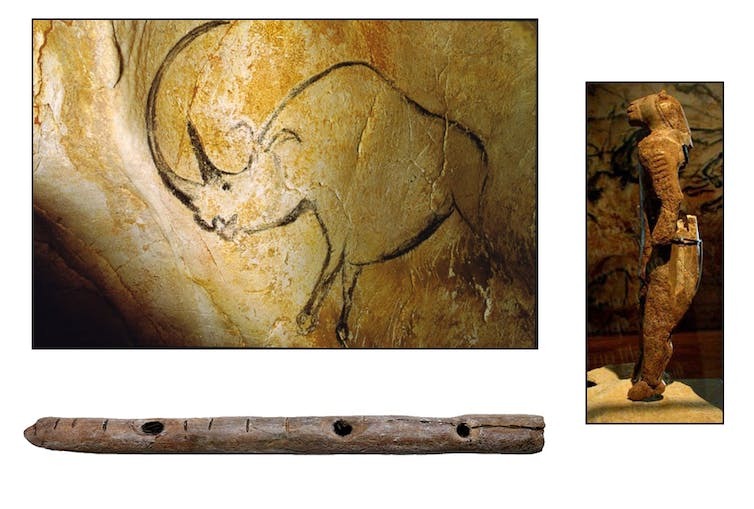 We can start by looking at how art, or the arts, were practised by early humans during the Upper Palaeolithic period, 40,000 to 12,000 years ago, and immediately thereafter. This period is a far longer stretch of human history than the “modern” age and so how the arts were practised during it should serve as the starting point for any viable explanation. And while art in the modern world is often exploited as a means of expressing individualism, during most of cultural evolution it was utilised by small hunter-gatherer groups as a means of articulating social norms among most, if not all, members of a community. Why should individuals engage in a preoccupation that requires significant effort, effort that could be better directed towards more immediately gainful activities, such as the search for food or other vital resources? One clue comes from the fact that art objects have special resonance because they come into being through human agency. This involves considerable emotional investment and, consequently, art acts as a crucial node in the complex web of things that make up a culture. The time and effort committed to making art suggests such behaviour may be a means of signalling to other members of a group. Paradoxically, the very fact that art remains inscrutable and has little obvious practical value is precisely what makes it important for assessing whether a person making art can be regarded as a trustworthy member of a group. In short, art provided a “costly signal” (altruistic behaviour that indirectly benefits the individual by establishing a reputation) for monitoring group allegiance and managing a trust network that weeded out freeloaders. When combined with ritual, which is often the case, art becomes an even more potent symbol. The notion that it can act as a vehicle for costly signalling is bolstered by the fact that art objects were regularly destroyed or defaced soon after being produced. This suggests that it was the process of making, rather than the final product, that was most significant. Rhinoceros depiction, Chauvet cave (Inocybe: Public domain). Therianthrope with lion and human-like features (JDuckeck: Public Domain). Flute from Germany (José-Manuel Benito Álvarez: Creative Commons Attribution). Though evidence of the arts serving this purpose exists before the Upper Palaeolithic, the surviving examples are controversial as they are few and far between. Not so from around 40,000 years ago, when art became much more complex, multifaceted and robust. Why was this? Part of the answer seems to be that population rates were on the rise leading to a growth in trade networks. This in turn meant that goods were regularly exchanged at sites where large numbers of people met at particular times of the year. In such large temporary assemblies, individuals would not have known each other well, so engaging in making art objects potentially provided a means of facilitating trust. Such “meaningless” behaviour suggests to those involved that if a person is willing to spend time and energy engaging in activities of this type, they are more likely to be reliable. Indeed, despite the time and effort expended communally to attain such an opaque goal, making and doing things together in such a way produces a sense of well-being and belonging. Emotional bonding is thereby encouraged that helps offset residual hostility towards unfamiliar others. Research indicates that when populations expand beyond 150-300 individuals, instability ensues, leading to new groups budding-off from the original community. This is thought to be because the human brain is unable to keep track of allegiances when that number is exceeded. Such splintering seems to have been a regular occurrence among early hunter-gatherers. Following the Upper Palaeolithic, however, clans began to form settled communities – probably due to the attraction of sites highlighted by art – that expanded beyond this 150-300 limit. Because of this, it was even more vital to have a mechanism for promoting trust among individuals who were unable to keep track of everyone they were living around. Art was well placed to fill this role. So, although art began to function as a form of social cement during the Upper Palaeolithic, this “function” became increasingly crucial during the early Neolithic when communities began to live in large stable settlements. Göbekli Tepe showing ‘temple’ complex and monoliths. Teomancimit: Creative Commons Attribution-Share Alike 3.0 Unported. A transitional phase can be found at the 12,000-year-old site of Göbekli Tepe (in south-eastern Turkey). Here, dispersed hunter-gatherer groups met to form relatively large, but temporary, communities at auspicious times of the year when they engaged in rituals. This site is believed to have served as a “temple” and consists of huge monoliths with engraved reliefs of animals that required considerable effort to produce. What is particularly fascinating is that, as a costly signal, monumental art of this kind appeared before the onset of settled agricultural communities. A finding that goes against received wisdom. This suggests that practical innovations, such as the ability to develop crops, were a spin-off from large gatherings of people who came together to meet and celebrate by indulging in “non-functional” activities. In short, it can be argued that art created civilisation, not the other way round. Artist’s impression of Catalhöyük. Wolfgang Sauber: Creative Commons Attribution-Share Alike 4.0 International Licence. The process of forming large settled communities eventually gave rise to one of the first towns – namely, Catalhöyük in southern Turkey. This site dates back 9,000 years and had a resident population of around 5,000. Crucially, the art was seamlessly integrated into the domestic lives of the community. 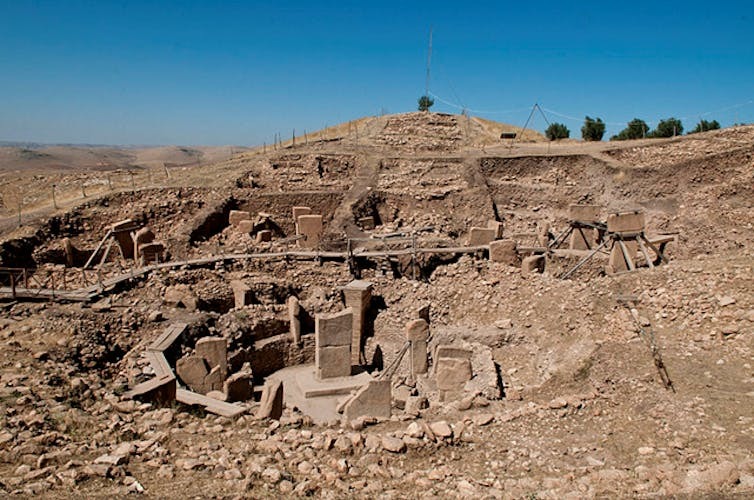 Moreover, at both Göbekli Tepe and Catalhöyük, the destruction and renewal of art objects occurred on a regular basis. For example, despite the effort expended in constructing the “temples” at Göbekli Tepe, the structures were often deliberately back-filled. A costly signal if ever there was one. Similarly, at Catalhöyük wall paintings were regularly whitewashed and repainted and “sculptures” often underwent a process of destruction and renewal. 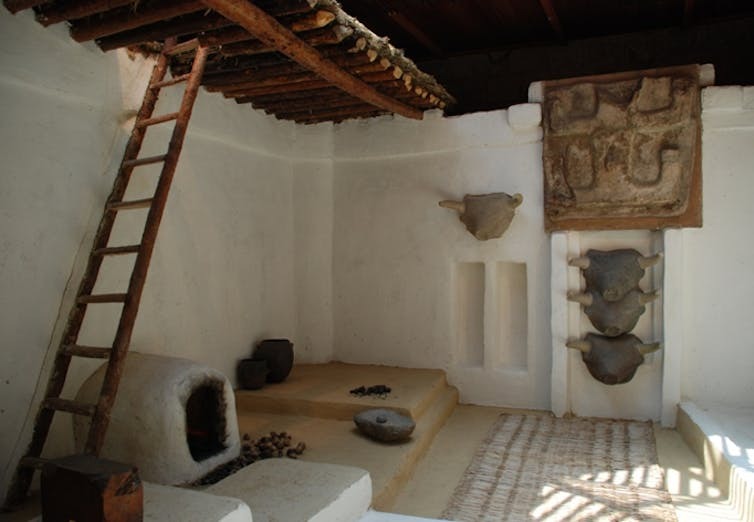 Mock-up of domestic interior of Catalhöyük house illustrating the importance of art to everyday life. Elelicht: Creative Commons Attribution-Share Alike 3.0 Unported licence. During the Neolithic, when more settled communities sprang up, the arts became a convenient means of signalling community allegiance as settlements began to compete with one another. It was a glue that held people together. Although conserving some of the features that typify ancient arts, modern Western art is now more concerned with the finished product than the process. Yet the arts in the modern world can still be regarded as a costly signal that is exploited as a way of gaining status within a particular social hierarchy.